I won’t acknowledge who gave this quote and I definitely won’t state whether I agree with the context in which it was said. In fact, I’m just going to paraphrase it: everyone needs help sometimes, everyone deserves help sometimes. The support of those around us often plays a big role in where we all are today. When chasing a dream, it’s a great feeling to know that there are people who will support you no matter where you are in your pursuit. But as the old cliché goes, it’s always better to give than to receive. As I turned the corner around our sprawling basketball arena in the heart of downtown Atlanta, I heard a few familiar things: the rumble of the train from the MARTA station across the street, the cars speeding past to get onto the ever-crowded Interstate 85 and even the sounds of the local restaurants. But then I heard something that was new for this area of the Georgia State campus: cheers. Music. There was a crowd somewhere close and I was coming up on it quickly. There was a buzz around the office for the past week about the inaugural match for our Women’s Sand Volleyball team that was taking place on Tuesday. Free food, neon tank tops and raffle tickets for a popular concert were floated in the air to draw students and adults to the event. All those things were wonderful incentives…but the match was taking place at 5:00pm, the exact time when every student is busy with class and every adult is surviving their last hour of work. So surely, this commotion could not be the result of a simple volleyball match. Why would so many people leave their jobs, classes and other engagements in the middle of a busy week just to watch a sporting event where there were no television cameras or even a proper concession stand? Because I firmly believe that humans are inherently drawn to the pursuit of dreams, whether it is their own or someone else’s. A dream is exciting. It’s a new chapter, a new beginning. It’s a chance to believe that hard work pays off in some way, shape or form. Hundreds, and I mean several hundreds, of people surrounded me as I climbed the few steps up to the brand new sand volleyball facility, located right behind the basketball arena. I saw students still wearing their backpacks, sitting in groups in the stands that were so filled that it was standing room only when I arrived. I saw faculty that were dispersed throughout the venue, talking and laughing with the very students they may have been teaching that same day. I saw big-time donors that were in attendance, not to be courted or wooed, but simply to be a part of a momentous occasion for their alma mater. It was truly such a rewarding feeling for me as part of the Athletic Department staff that I almost forgot to stop and watch the volleyball that was being played! After spending almost 30 minutes walking around the facility, filling my dress shoes with the sand from the courts, I realized I couldn’t stay much longer. But for some reason, there was this nagging feeling of wanting to stay as if I was watching my own alma mater play football. Why exactly was I drawn to this atmosphere? Simply because I was with a group of people that believed in a dream. 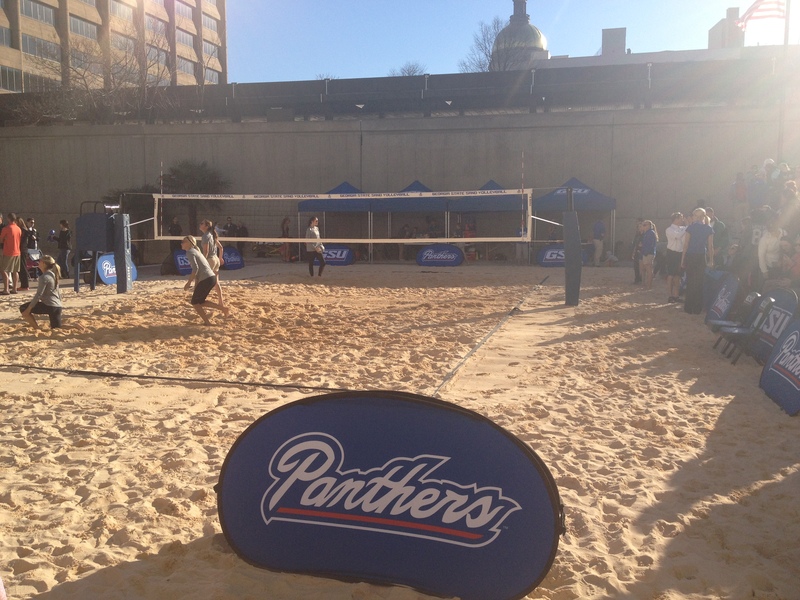 The 12 girls that make up the Georgia State Sand Volleyball team come from all over the country. A few even came from other colleges to be a part of our inaugural season. They have spent countless hours traveling, training and waiting for the opportunity to realize their ultimate dream. So when they found themselves on the losing end of the first two matches of the meet, with only three left to play, they undoubtedly looked within themselves for the final push towards their goal. But in case they couldn’t find it there, all they had to do was look around. Those same students that sit front row at the basketball games, heckling the opposing team and starting different chants, could be found within inches of the outer edges of the court. Cheering as if it was the championship game. Believing that the girls had set out to accomplish more today than simply showing up. All of us need those same supporters in our pursuit of our own dreams. No matter where you are in your chase, whether you’re at the beginning or at the precipice of realization, having people around you that believe is always welcomed. So be that person. For your friends, for your family, for someone you haven’t even met before. Be the final push they need to reach the pinnacle of their dreams. And in case you don’t believe in the power of support? How about the fact that the Georgia State girls came back to win the final three matches of the day, claiming glory in front of hundreds of adoring supporters. Want more motivation? Check out the previous Daily Driver! Thanks for checking out the Daily Driver post on “The Drive.” Come back every day for daily quotes, pictures, people or moments that we hope can provide inspiration or motivation in your life. Or follow us on Twitter @TheDriveSports and look for #DailyDriver to get your daily dose of inner fire! I not to mention my guys have aadrley been digesting the brilliant points from your web site then unexpectedly got a horrible suspicion I had not thanked you for those secrets. My guys became for this reason excited to see all of them and have in actuality been making the most of those things. I appreciate you for indeed being quite helpful and for making a choice on this kind of fantastic themes millions of individuals are really wanting to know about. My very own sincere regret for not expressing gratitude to you sooner.